I worked on a few improv blocks last night. 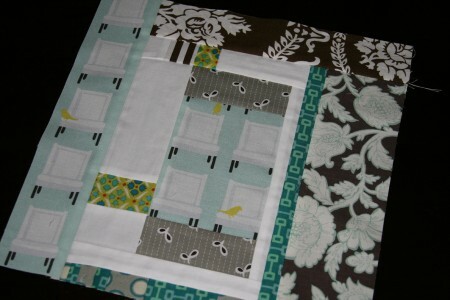 I don’t typically make these types of blocks — while I try never to use a pattern, I do usually have a plan of some sort. Making these types of blocks without any real plan takes some getting used to. It’s easy for me to start overthinking and overdoing it. I find when I make one block at a time, I’m more apt to try and pack too much into that block. I like a cleaner, more simple look, so I have to continually remind myself that less can be more. But now, can I talk about that chair fabric? It’s designed by the talented Laurie Wisbrun and printed by Spoonflower. (You can buy it in her Etsy shop) There’s something about a chair printed on fabric that really gets me (remember my wall hanging?). She now has it available in other colors, and I’ve been drooling over them as well. (maybe if I say enough about it she’ll send me some? Shameless, right? I’m kidding, of course.) 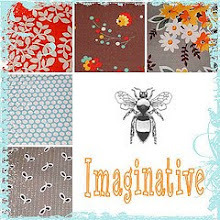 I’ve selected a few other fabrics from Jennifer Pagnelli, Erin Michael’s new line, Lush, and of course, my favorite Flea Market Fancy. And lastly, this one, which I’m not entirely sold on… not yet, anyway! You can see that I’m having a hard time breaking out from the straight lines. I’ll be working on that! 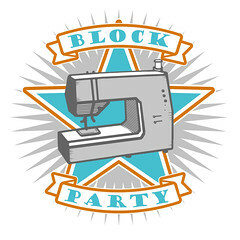 This entry was posted in Household Sewing - bags, napkins, pillows and tagged erin michaels, flea market fancy, handmade, lush, pieced, project improv, Quilt Blocks, quilting. Bookmark the permalink. I just found your blog, and I am in love! I am in your shoes, only one year later. I am currently taking a sewing class, because my mom can’t teach me (she used to safety pin on my brownie badges :))! I am pretty sure I will not be as prolific as you, but I am surely inspired. Can you let me know what the white fabric is in all of your quilts? I think part of what I love about your style of quilts is the use of so much white, I find many quilts to be too busy. Thanks! Your blocks are looking great! I haven’t started on mine – but I’m with you. I tend to overplan blocks too. This will definitely be a challenge. I just found your blog a couple of months ago and I have been lurking, but I just needed to let you know that your quilts are wonderful. I really enjoy reading your blog and I look forward to seeing your improv quilt come to life. Love them!! And you’re right about that bird fabric… it’s GREAT! Too bad about my fabric buying ban… sniff sniff. 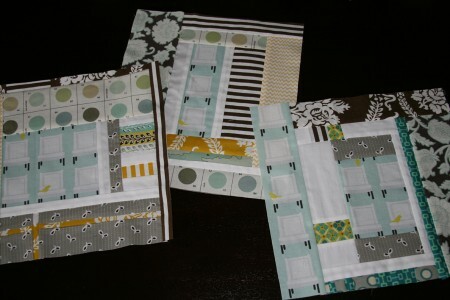 I love them and think your choice of fabrics is great. Love the chair fabric! The chairs look great in those blocks. I’ve seen the chairs in her shop- but I wouldn’t have thought to put them in a block. Boy, they look really good there! Nice Fabric choices. You’ve got a couple of my favorites in there! 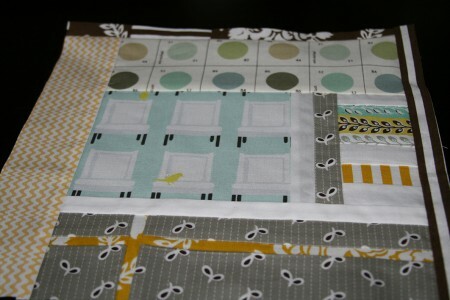 I’m soooooo excited to see the birdies on chairs in a quilt block! Your work is, as always, Gorgeous with a capital G. And you have done such a lovely job finding coordinating fabrics to go with the chairs. I’m waiting on pins and needles to see the final result! Ash, once again I’m just amazed at your prowess, skill and color combinations. And, since I didn’t get it together to comment under “sally gets a quilt” back in December, let me say that both Sally (the doll) and the child are thrilled with your baby doll quilt. They are cozied up in it as we speak. Stay warm! Way to try things out- these blocks look great. it is fun trying to identify the areas to experiement in. They’re lovely! Your fabric choices are wonderful and you’re right, that chair fabric is to die for. Love, LOVE the color combo. Such a beautiful combination of blue and grey with that touch of mustard, so great! 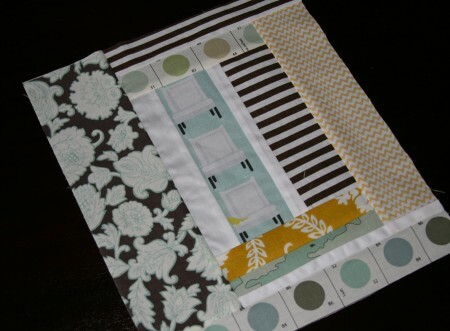 First, LOVE that fabric, I love the piecing, and your color combo.